This page includes lighthouses of the Japanese prefecture of Ōsaka, including the greater Ōsaka metropolitan area. Ōsaka Prefecture faces west on Ōsaka Bay, the eastern end of the Seto Inland Sea (Seto Naikai), which separates Honshū from Shikoku. It is a coast crowded with port facilities. These industrialized facilities continue westward through the city of Kōbe, which is in Hyōgo Prefecture. 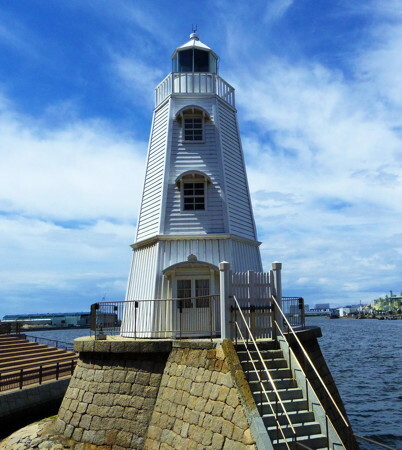 Since port areas are typically closed to casual visitors, information on the many harbor lights of Ōsaka is rather scarce. 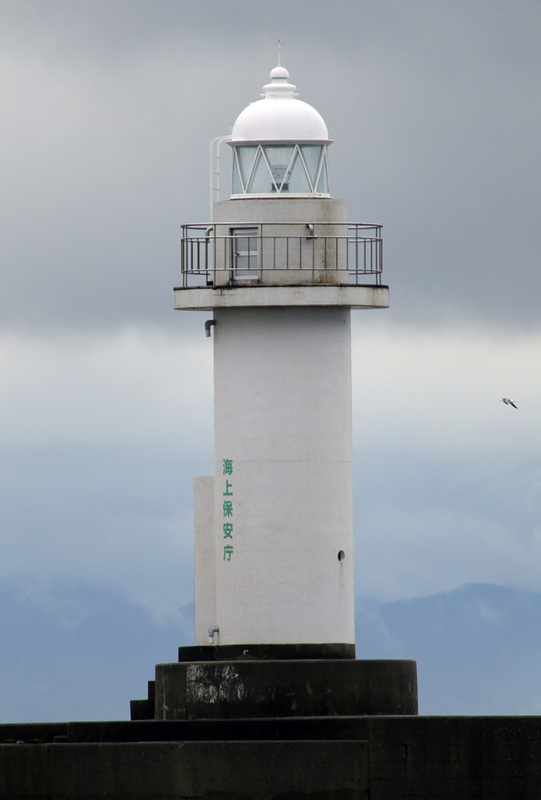 In Japanese, the word for a lighthouse is tōdai or toudai (灯台). The words saki and misaki are for capes and headlands, shima (also spelled sima or jima) is an island, wan is a bay, and ko is a harbor. 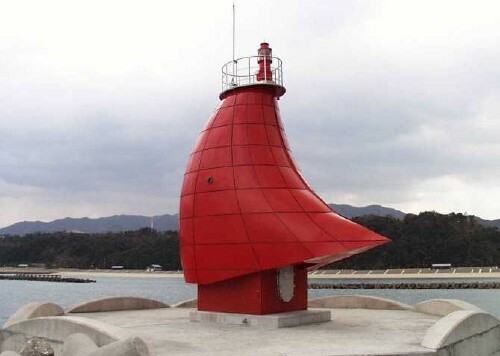 Lighthouses in Japan are operated and maintained by the Japanese Coast Guard's Maritime Safety Agency, and specifically the Ōsaka Coast Guard Office. 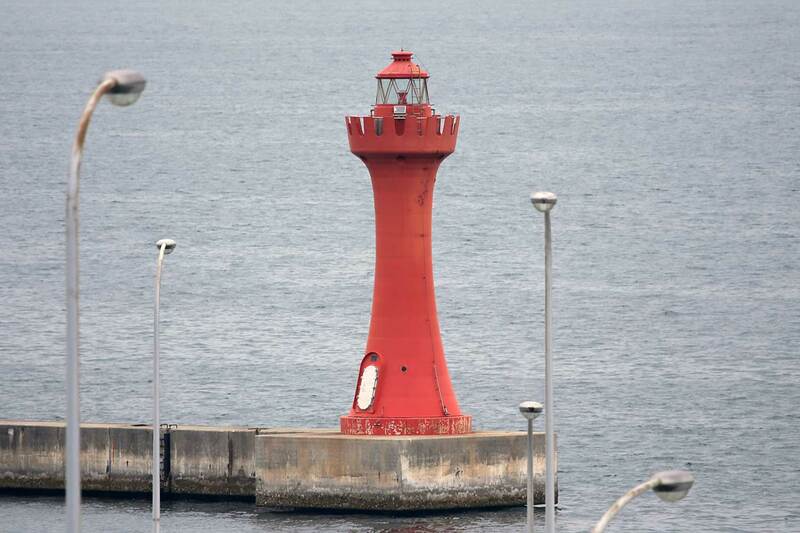 Posted by the Ōsaka Coast Guard Office, this page has small photos of every JCG light in the prefecture. This generally comprehensive site has only a single Ōsaka light. A page from a large site; unfortunately only a few Ōsaka lights are included. Another large web site, but with only a few Ōsaka lights. Cited below as FOAL. 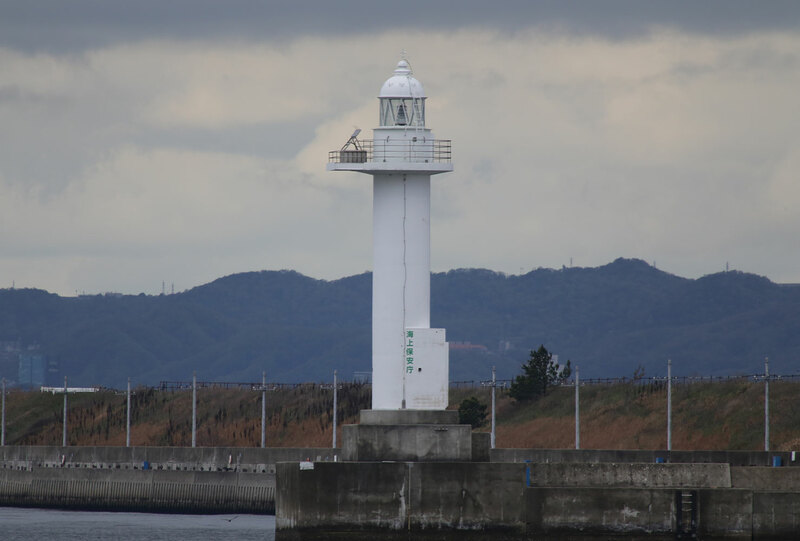 This site has many photos of Japanese lighthouses, but only a few from Ōsaka. 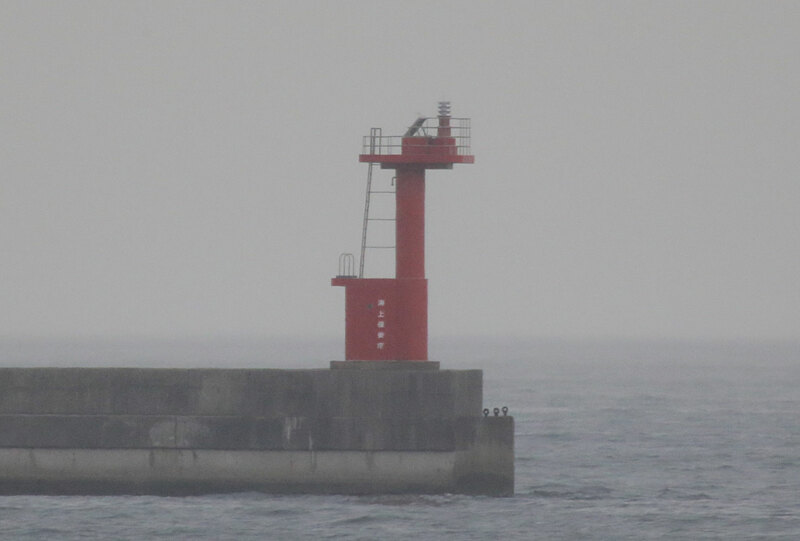 This site also has many excellent photos of Japanese lighthouses. Wikipedia article on the Scottish engineer who built most of Japan's oldest lighthouses. 1969. Active; focal plane 12 m (39 ft); red light, 2 s on, 2 s off. 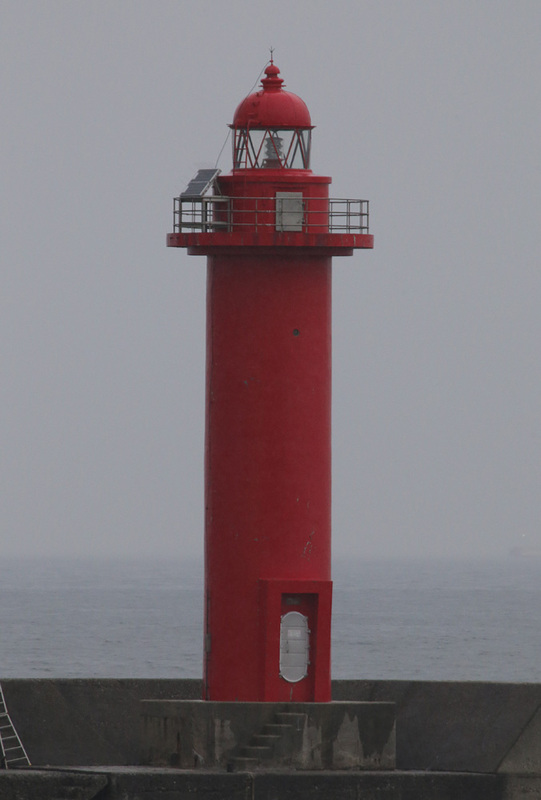 10 m (33 ft) round hourglass-shaped red concrete tower. Trabas has a photo, FOAL has photos, I. Awshi has a street view, and Google has a satellite view. Located at the end of the west breakwater of Fuke Kō, a small harbor at the southern end of Ōsaka Bay. Accessible by walking the pier. Site open, tower closed. ARLHS JPN-1907; JCG-3506; Admiralty M5958; NGA 7212. 1966. Active; focal plane 13 m (43 ft); green light, 2 s on, 2 s off. 10 m (33 ft) round hourglass-shaped white concrete tower. Trabas has a photo, FOAL has photos, I. Awshi has a street view, and Google has a satellite view. 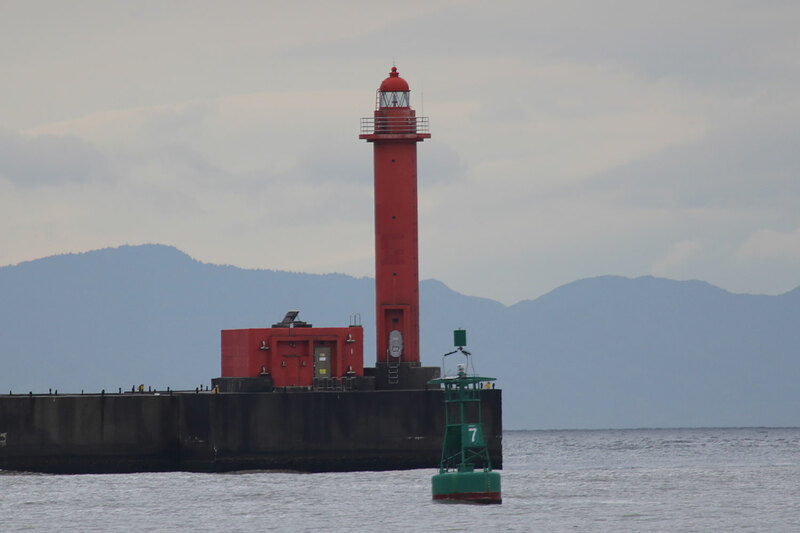 Located at the end of the east breakwater of Fuke Kō. Accessible by walking the pier. Site open, tower closed. ARLHS JPN-1906; JCG-3509; Admiralty M5958.2; NGA 7224. 1997 (station established 1963). 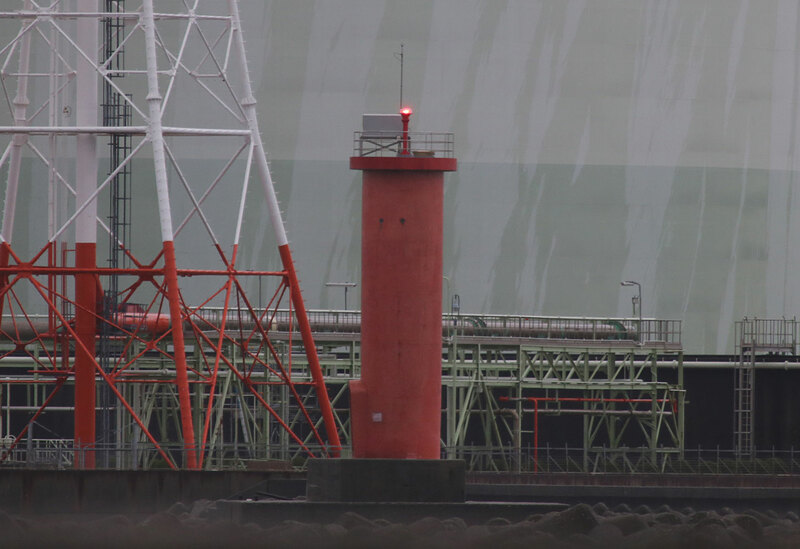 Active; focal plane 13 m (43 ft); continuous red light with a more intense flash every 5 s. 8.5 m (28 ft) square tapered concrete tower, surrounded by a "skirt" designed to resemble the sail of a yacht. Entire lighthouse is red. A Coast Guard photo is at right, Trabas has a photo, FOAL's page has photos, and Google has a street view and a satellite view. Tannowa is a well known sailing center, and the "sail" was added to the light in 1997 to create a symbol for the town. Located at the end of the main breakwater of Tannowa harbor in Sennan. Accessible by walking the pier. Site open, tower closed. ARLHS JPN-1930; JCG-3510; Admiralty M5957.83; NGA 7228. Date unknown. Active; focal plane 11 m (36 ft); red flash every 3 s. 8.5 m (28 ft) concrete post with gallery, rising from a square 1-story equipment room. Entire lighthouse is red. The Coast Guard has a photo, Trabas has a photo, and Google has a satellite view. 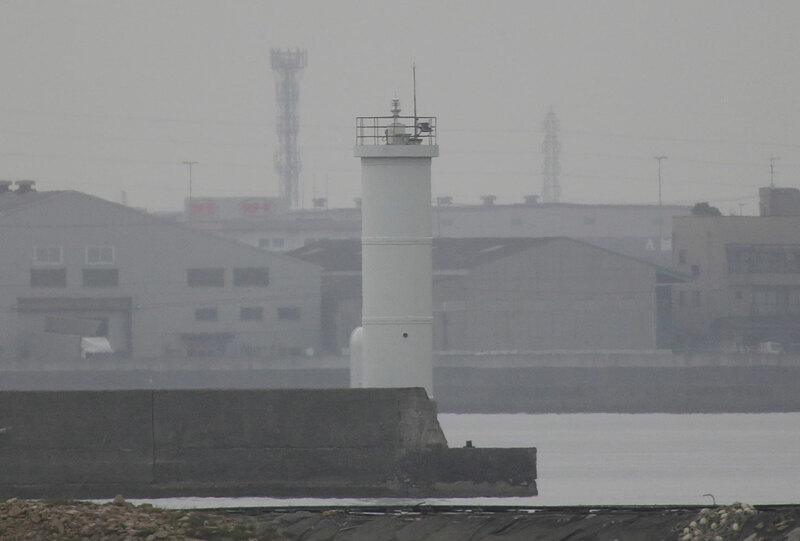 Located at the end of the outer breakwater of Ozaki, a small port at the southern end of Ōsaka Bay. Site and tower closed. JCG-3510.71; Admiralty M5957.7; NGA 7230.6. Date unknown. Active; focal plane 15 m (49 ft); red light, 2 s on, 2 s off. 13 m (43 ft) round hourglass-shaped concrete block tower with lantern and gallery. Entire lighthouse is red. The tower is floodlit at night. A photo is at right, Trabas has a closeup photo, a photo showing both breakwater lighthouses is available, and Google has a satellite view. Ōsaka's airport, Kansai International, is built on an artificial island in Ōsaka Bay about 40 km (25 mi) south of the city. Most travelers arrive at the airport by monorail or express trains, but there is also a high speed ferry service that brings travelers across the bay from Kōbe (on the north) and from Sumoto on Awaji island to the west. 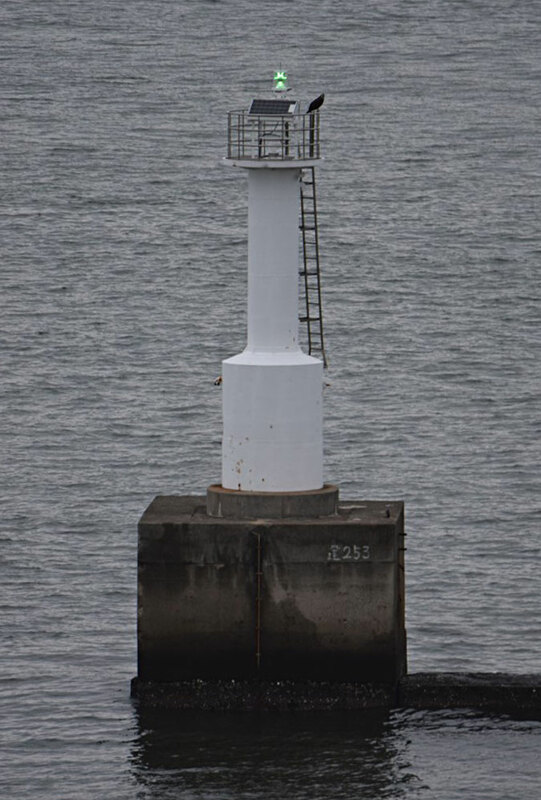 This lighthouse marks the entrance to the small ferry harbor, at the north end of the artificial island. Located at the end of the curved breakwater on the north side of the ferry harbor. Site and tower closed, but there must be excellent views from the ferries. ARLHS JPN-1913; JCG-3512.71; Admiralty M5957.59; ex-NGA 7238. Date unknown. Active; focal plane 12 m (39 ft); green light, 2 s on, 2 s off. 10 m (33 ft) round hourglass-shaped concrete block tower with lantern and gallery. Entire lighthouse is white. The tower is floodlit at night. Trabas has a closeup photo, a photo showing both breakwater lighthouses is available, and Google has a satellite view. Located on the short south breakwater of the airport's ferry harbor. Site and tower closed, but there must be excellent views from the ferries. ARLHS JPN-1912; JCG-3512.7; Admiralty M5957.585; ex-NGA 7239. 2010. Active; focal plane 13 m (43 ft); two red flashes every 5 s. 8.5 m (28 ft) concrete post with gallery, rising from a square 1-story equipment room. Entire lighthouse is red. The Coast Guard has a photo, Trabas has a closeup photo, FOAL's page has photos (top half of the page), and Google has a satellite view. This light and the next one are listed as "Hannan Ko" lights by NGA. 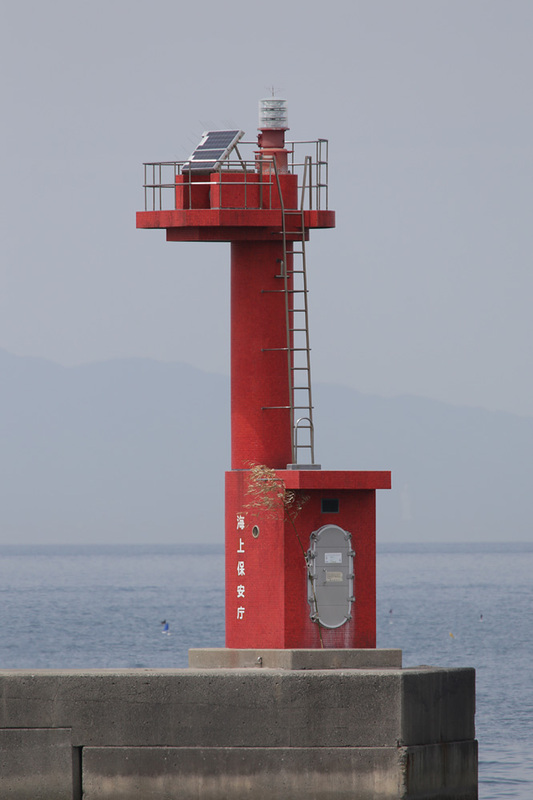 Located at the end of the outer breakwater of Izumisano, which is just east of Kansai International Airport. Accessible by walking the pier (which is very popular with fishermen). Site open, tower closed. JCG-3518.5; Admiralty M5957.52; NGA 7235. 1961. Active; focal plane 13 m (43 ft); green flash every 4 s. 8.5 m (28 ft) round concrete tower, flared at the top, attached to a small equipment shelter. Entire lighthouse is white. The Coast Guard has a photo, Trabas has a closeup photo, FOAL's page has photos (bottom half of the page), and Google has a satellite view. Located at the end of the north breakwater of a yacht harbor just north of the bridge to the airport. Accessible by walking the pier. Site open, tower closed. JCG-3518; Admiralty M5957.4; NGA 7236. Date unknown. Active; focal plane 16 m (52 ft); two red flashes every 7 s. 16 m (52 ft) round cylindrical concrete tower with lantern and gallery. Entire lighthouse is red. The Coast Guard has a photo, Trabas has a good photo, and Google has a street view and a satellite view. 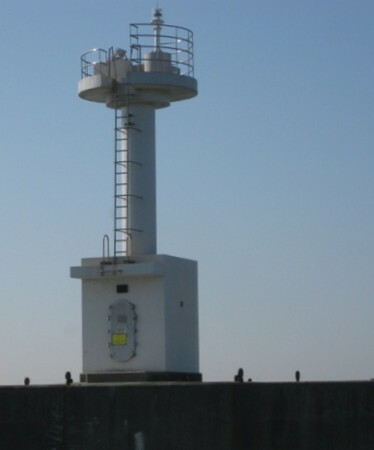 Located at the end of the detached outer breakwater of Izumisano. Accessible only by boat. Site and tower closed. JCG-3519; Admiralty M5957.2; NGA 7240. Note: Kishiwada is a seaport with a population of about 200,000 located about 20 km (13 mi) south of Ōsaka. Date unknown. Active; focal plane 13 m (43 ft); red flash every 3 s. 9 m (29 ft) concrete post attached to a rectangular 1-story equipment shelter. Entire lighthouse is red. The Coast Guard has a photo, Trabas has a photo, FOAL has a photo (3/4 the way down the page, on the left), and Google has a satellite view. Located at the end of the main breakwater sheltering Hannan harbor. Site status unknown. ARLHS JPN-1909 (? ); JCG-3521.55; Admiralty M5955.3; NGA 7242. Date unknown. 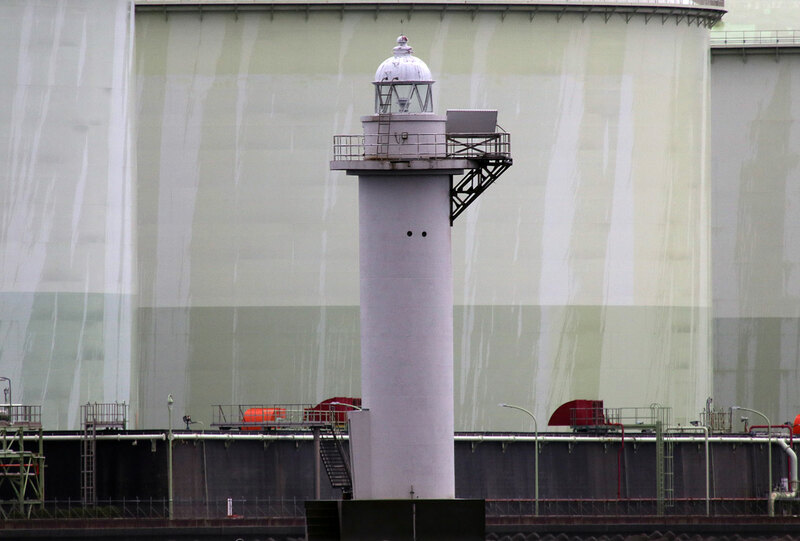 Active; focal plane 13 m (43 ft); two green flashes every 6 s. 10 m (33 ft) round cylindrical white concrete tower. The Coast Guard has a photo, Trabas has a photo, FOAL has photos (top of the page), and Google has a satellite view. 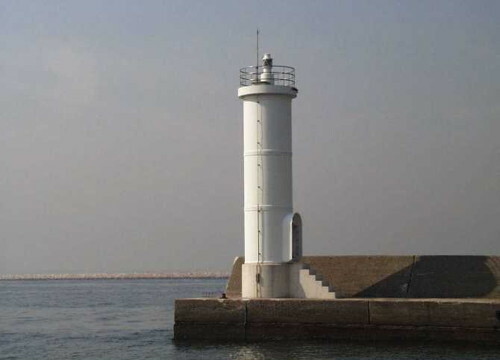 Located on a short inner breakwater of an industrial harbor at the southern edge of Kishiwada. Accessible by walking the pier. Site open, tower closed. ARLHS JPN-1911; JCG-3520; Admiralty M5956.2; NGA 7244. Date unknown. Active; focal plane 15 m (49 ft); green flash every 3 s. 11 m (36 ft) round white concrete tower, flared at the top, attached to a small equipment shelter. The Coast Guard has a photo, Trabas has a photo, FOAL has a photo (3/4 the way down the page, on the right), and Google has a satellite view. This breakwater was formerly detached, but expansion of the port has brought it in contact with the shore. Site status unknown. ARLHS JPN-1910; JCG-3521; Admiralty M5955.5; NGA 7248. Date unknown. Active; focal plane 13 m (43 ft); green flash every 4 s. 11 m (36 ft) round white concrete tower, probably with lantern and gallery. A photo is at right, the Coast Guard has another photo, Trabas has a photo, FOAL has a photo (halfway the way down the page), and Google has a satellite view. 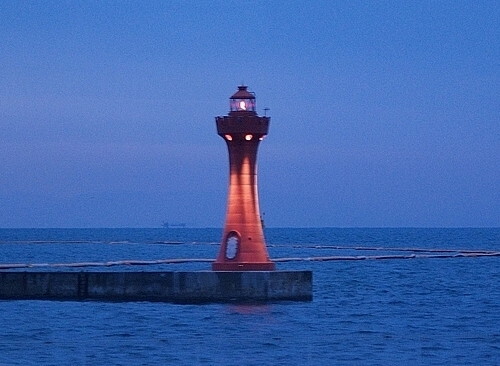 The breakwater is about 1.5 km (1 mi) long, protecting the Kishiwada waterfront. Located at the south end of the breakwater. Accessible only by boat. Site and tower closed. ARLHS JPN-1908; JCG-3525; Admiralty M5955.04; NGA 7264. Date unknown. Active; focal plane 16 m (52 ft); three red flashes every 13 s. 16 m (52 ft) round cylindrical concrete tower with lantern and gallery. Entire lighthouse is red. The Coast Guard has a photo, Trabas has a closeup photo, FOAL has a photo (3/4 the way down the page, on the right), and Google has a satellite view. 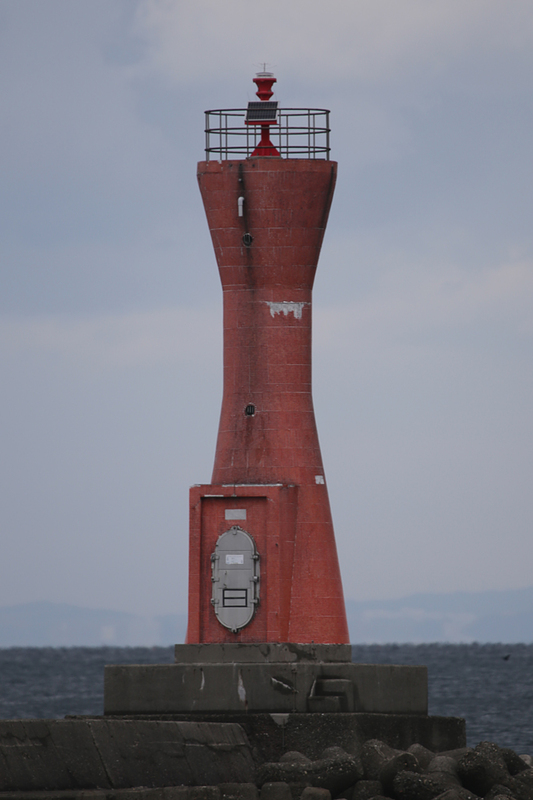 Located at the north end of the detached west breakwater of Kishiwada. Accessible only by boat. Site and tower closed. ARLHS JPN-1914; JCG-3524; Admiralty M5955; NGA 7260. Date unknown. 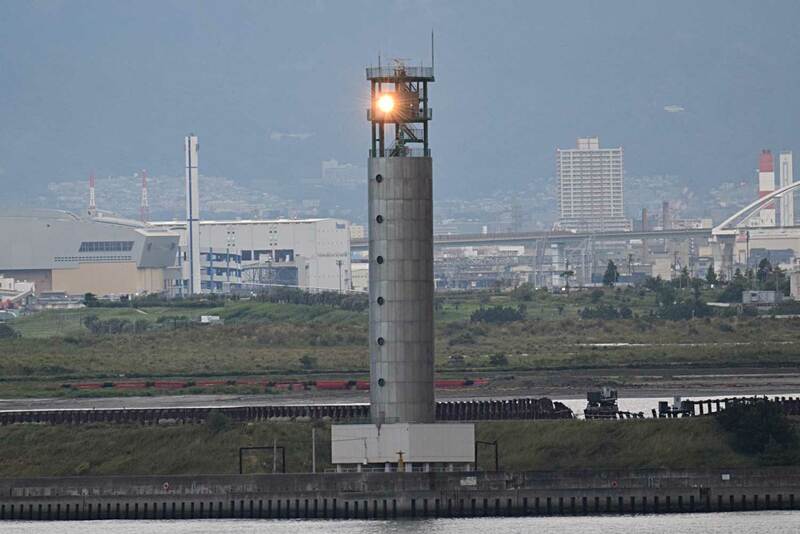 Active; focal plane 18 m (59 ft); red flash every 3 s. 16 m (52 ft) round cylindrical concrete tower with lantern and gallery. Entire lighthouse is red. The Coast Guard has a photo, Trabas has a closeup photo, FOAL has a photo (second row, right), and Google has a satellite view. Located at the northeast corner of a large new wharf area constructed on fill at Senboku, about 5 km (3 mi) north of Kishiwada. Site and tower closed. ARLHS JPN-1928; JCG-3529; Admiralty M5953.6; NGA 7272. Date unknown. Active; focal plane 12 m (39 ft); green flash every 5 s. 8.5 m (28 ft) concrete post rising from a square concrete equipment room. Entire lighthouse is white. The Coast Guard has the photo at right and another photo, Trabas has a photo, FOAL has a photo (second row, left), and Google has a good satellite view. 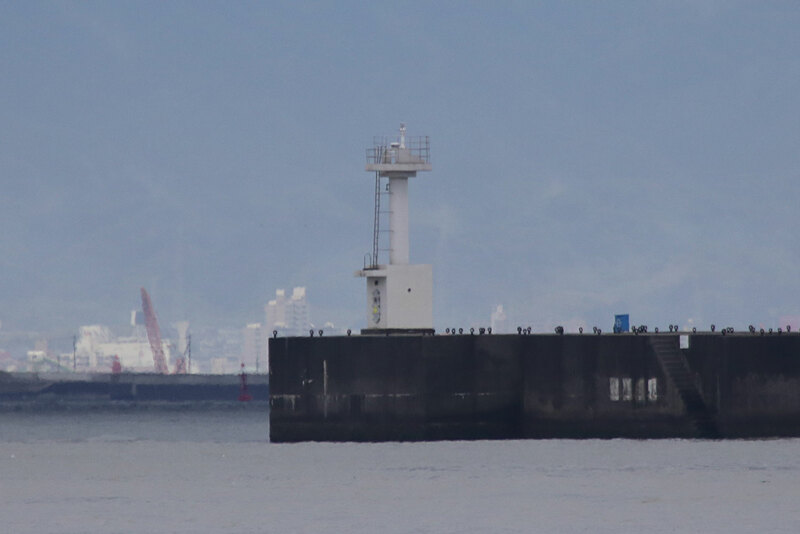 Located at the end of the east breakwater of Senboku. Site status unknown. JCG-3532; Admiralty M5953; NGA 7280. Note: Sakai is a historic seaport on the southern edge of Ōsaka. The city has a population of about 850,000. Date unknown. Active; focal plane 18 m (59 ft); red light, 3 s on, 3 s off. 16 m (52 ft) round cylindrical concrete tower. 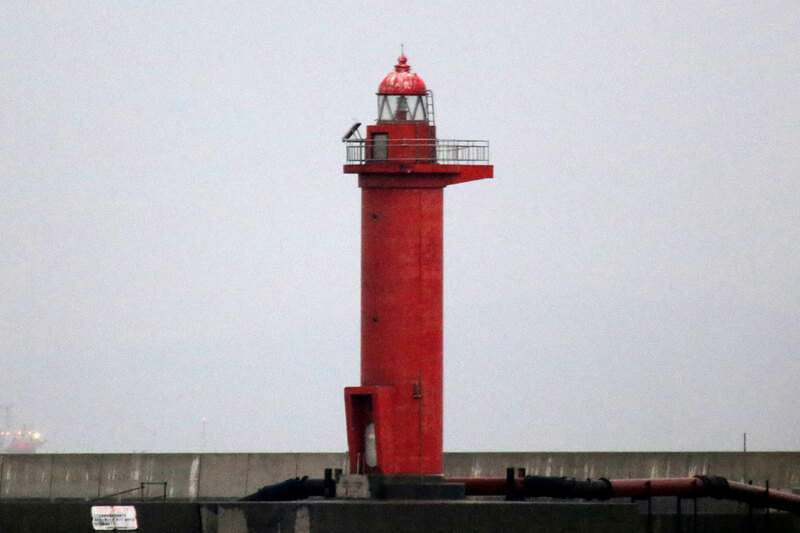 Entire lighthouse is red. The Coast Guard has a photo, Trabas has a photo, FOAL has photos (bottom of the page), and Google has a satellite view. 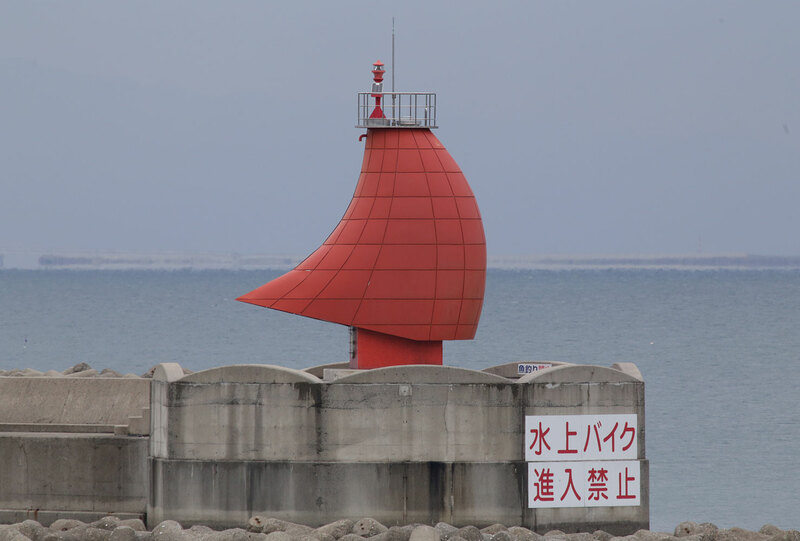 Located at the end of the short south breakwater at the entrance to the south harbor of Sakai, on the south side of Ōsaka. Site and tower closed. ARLHS JPN-1927; JCG-3552; Admiralty M5951; NGA 7288. Date unknown. Active; focal plane 18 m (59 ft); red light, 3 s on, 3 s off. 14 m (46 ft) round cylindrical concrete tower with lantern and gallery. Entire lighthouse is white. The Coast Guard has a photo, Trabas has a closeup, FOAL has photos (bottom of the page), and Google has a satellite view. Located at the end of the short north breakwater at the entrance to the south harbor of Sakai, on the south side of Ōsaka. Site and tower closed. ARLHS JPN-1926; JCG-3551; Admiralty M5950; NGA 7284. 1877. Inactive since 1968 (a decorative light is displayed). 11 m (36 ft) hexagonal wood tower with lantern and gallery, painted white. Hiroaki Kaneko's photo is at the top of this page, Giles Thomas has a good closeup, Wikimedia has a photo, Motoharu Sumi has a 2009 photo, Trane DeVore has a photo, Forand has a historic postcard view, and Google has a satellite view and Aori Ika's street view. 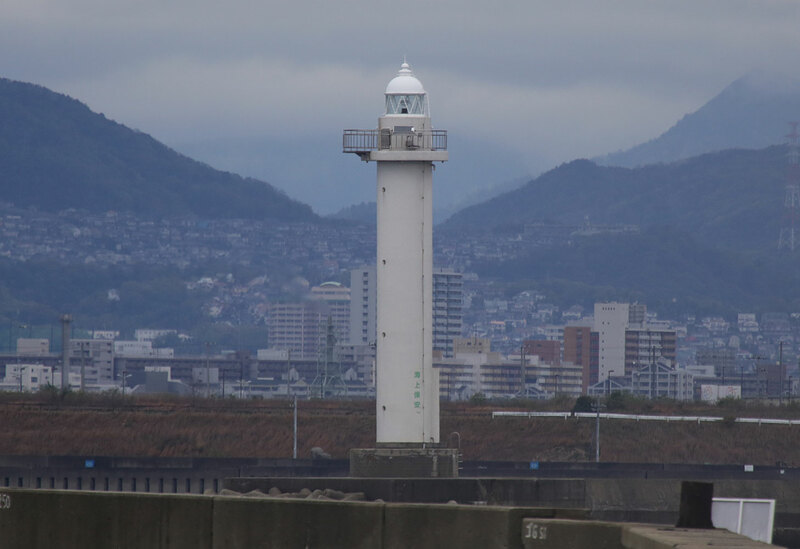 Sakai is justifiably proud of this lighthouse, which was built by the town government at a time when Japan had fewer than 30 Western-style lighthouses. 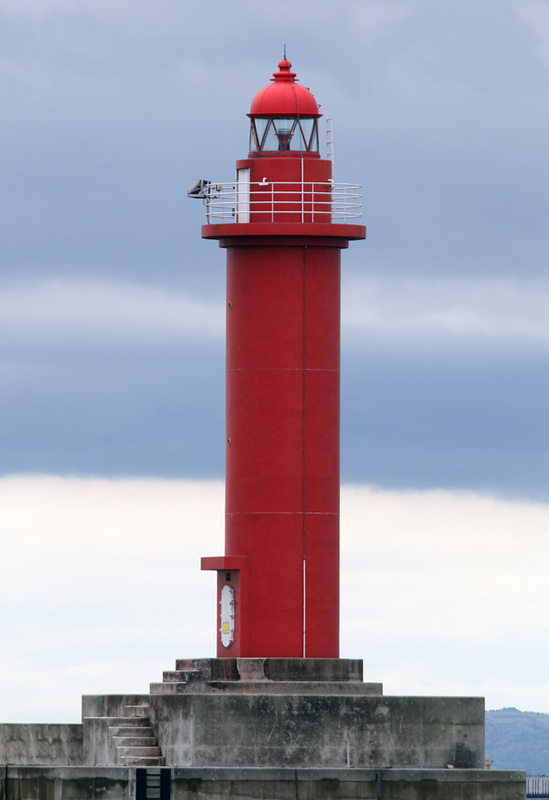 Forand has a second postcard view that shows the lighthouse at the end of the city's long breakwater. In 2006, the historic lighthouse was restored and relocated to a new pier. The lighthouse reopened to the public in March 2007. Located on the southern seawall of Sakai. Date unknown. 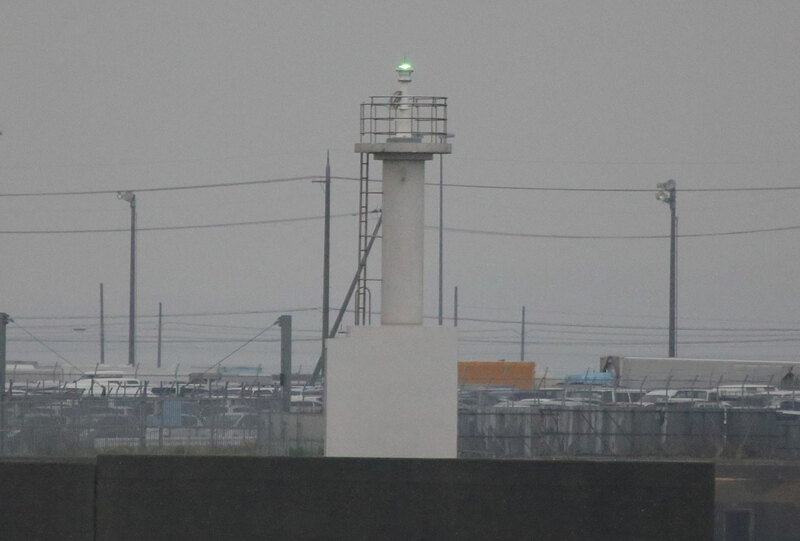 Active; focal plane 14 m (46 ft); green flash every 4 s. 10 m (33 ft) round white concrete tower. The Coast Guard has a photo, Trabas has a photo, and Google has a satellite view. Located at the south end of a detached breakwater on the south side of the entrance to the north harbor of Sakai. Accessible only by boat. Site and tower closed. ARLHS JPN-1925; JCG-3554; Admiralty M5939.8; NGA 7292. Date unknown. Active; focal plane 22 m (72 ft); red light, 2 s on, 2 s off. 19 m (62 ft) round concrete tower with lantern and gallery. Entire lighthouse is red. The Coast Guard has a photo, Trabas has a photo, FOAL has distant views (top of the page), and Google has a satellite view. 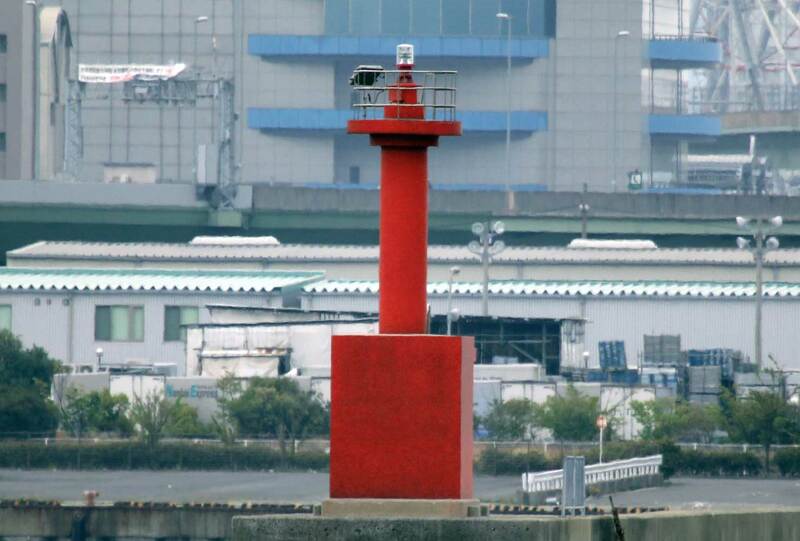 Located at the seaward end of a detached breakwater on the south side of the entrance to the north harbor of Sakai. Accessible only by boat. Site and tower closed. ARLHS JPN-1924; JCG-3555; Admiralty M5939.7; NGA 7296. Note: Located at the head of Ōsaka Bay, Ōsaka is Japan's third largest city with a population of about 2.7 million. Date unknown. 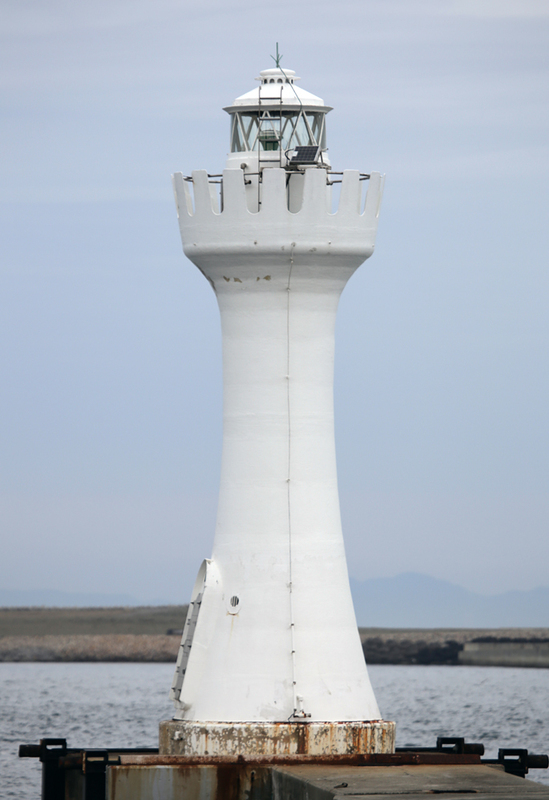 Active; focal plane 15 m (49 ft); green flash every 4 s. 12 m (39 ft) round white concrete tower with lantern and gallery. The Coast Guard has a photo, Trabas has a good photo, FOAL has photos (first and second rows, on the right), and Google has a good satellite view. 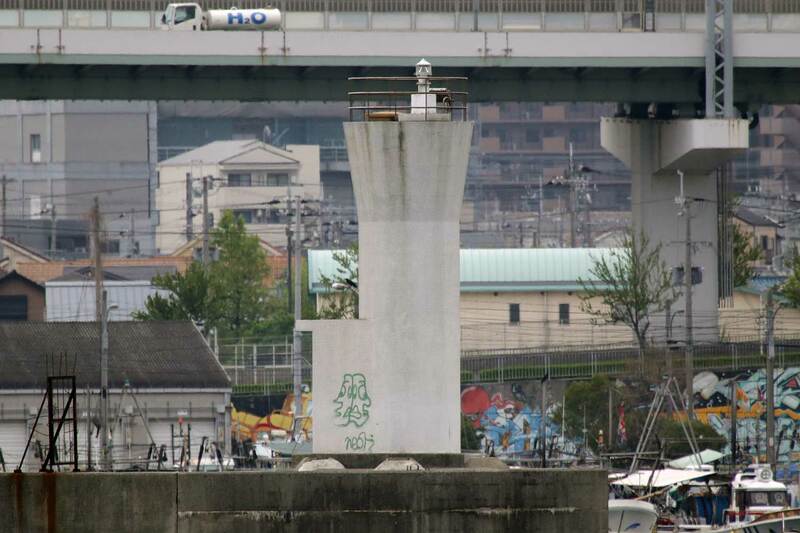 Located at the end of a short breakwater at southern end of the harbor, across from the Sakai waterfront. Site status unknown. ARLHS JPN-1922; JCG-3579; Admiralty M5940; NGA 7304. Date unknown. Active; focal plane 12 m (39 ft); two green flashes every 6 s. 9.5 m (31 ft) concrete post attached to a 1-story concrete equipment shelter. Entire lighthouse is white. The Coast Guard has a photo, Trabas has a closeup, FOAL has a photo (third row, on the right), and Google has a good satellite view. 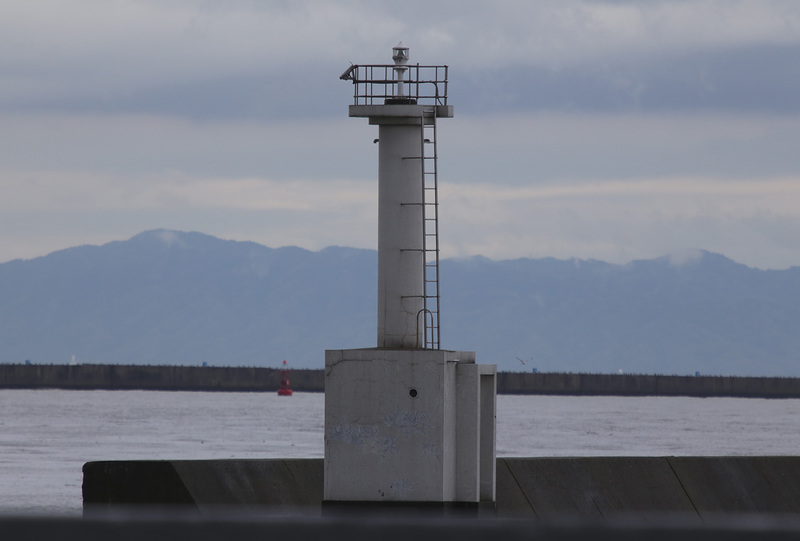 Located at the end of a short breakwater at the entrance to one of basins of Ōsaka's south harbor. Site and tower closed. ARLHS JPN-1919; JCG-3580; Admiralty M5945; NGA 7308. Date unknown. Active; focal plane 21 m (69 ft); two red flashes every 7 s. 19 m (62 ft) round concrete tower with lantern and gallery. Entire lighthouse painted red. A Coast Guard photo is at right, Trabas has a photo, FOAL has additional photos (fourth row right and next to last photo), and Google has a satellite view. 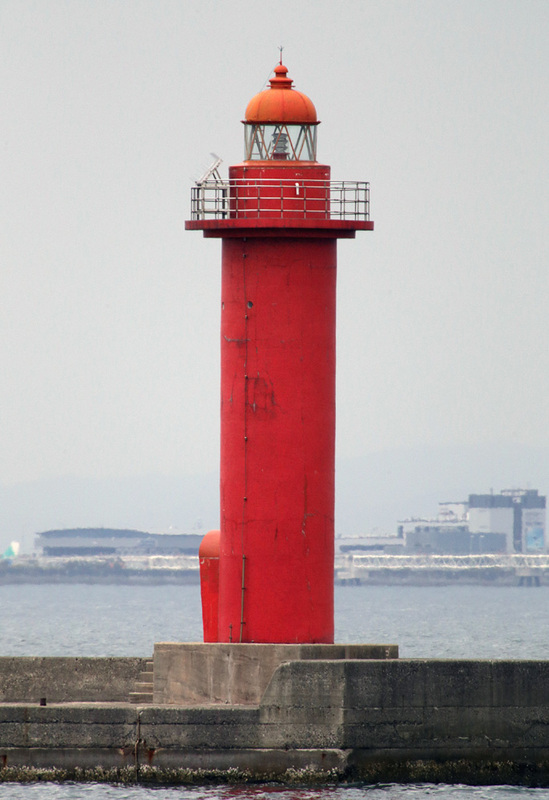 Located at the end of the breakwater on the south side of the entrance to Ōsaka's south harbor. Site and tower closed. ARLHS JPN-1921; JCG-3582; Admiralty M5939.4; NGA 7316. Date unknown. Active; focal plane 21 m (69 ft); two green flashes every 7 s. 19 m (62 ft) round concrete tower with lantern and gallery. Entire lighthouse painted white. The Coast Guard has a photo, Trabas has a photo, FOAL has additional photos (fourth row left and last photo), and Google has a good satellite view. 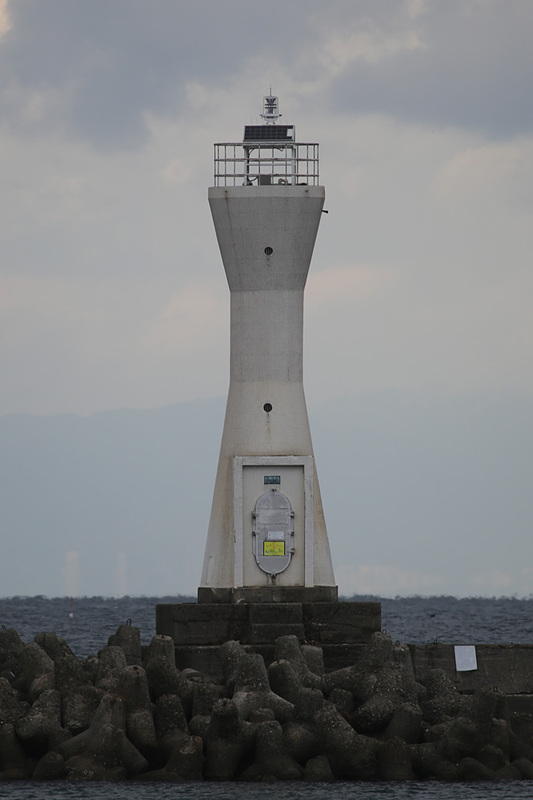 Located at the end of the breakwater on the north side of the entrance to Ōsaka's south harbor. Site and tower closed. ARLHS JPN-1920; JCG-3581; Admiralty M5939; NGA 7312. Date unknown. Active; focal plane 19 m (62 ft); red light, 2 s on, 2 s off. 17 m (56 ft) round concrete tower with lantern and gallery. Entire lighthouse painted red. Trabas has a good photo, FOAL has a photo (second row, right), the Coast Guard has a photo, and Google has a satellite view. In 2010 the lighthouse was under restoration to correct a lean apparently caused by a failure in the underlying breakwater. 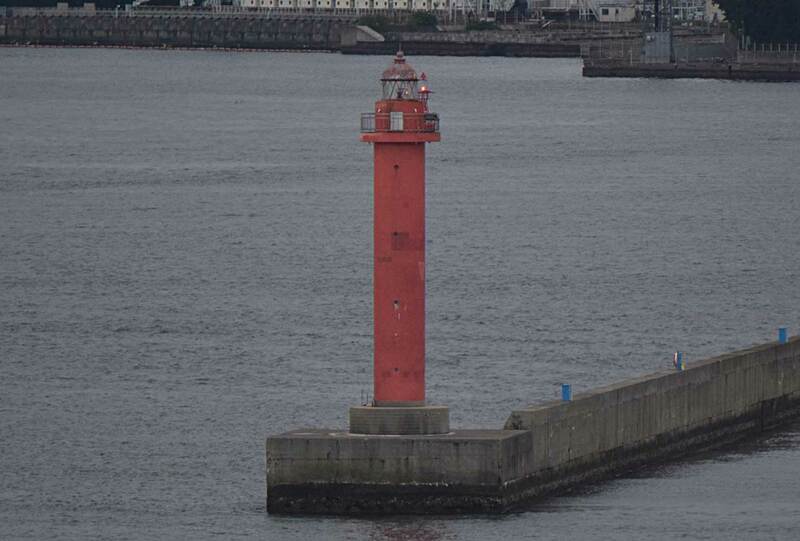 Located on a short breakwater on the south side of the entrance to Ōsaka's traditional harbor. Site and tower closed. JCG-3589; Admiralty M5918. Date unknown. Active; focal plane 19 m (62 ft); white light, 2 s on, 2 s off. 17 m (56 ft) round concrete tower with lantern and gallery. Entire lighthouse painted white. Trabas has a good photo, FOAL has a photo (second row, left), the Coast Guard has a photo, and Google has a satellite view. 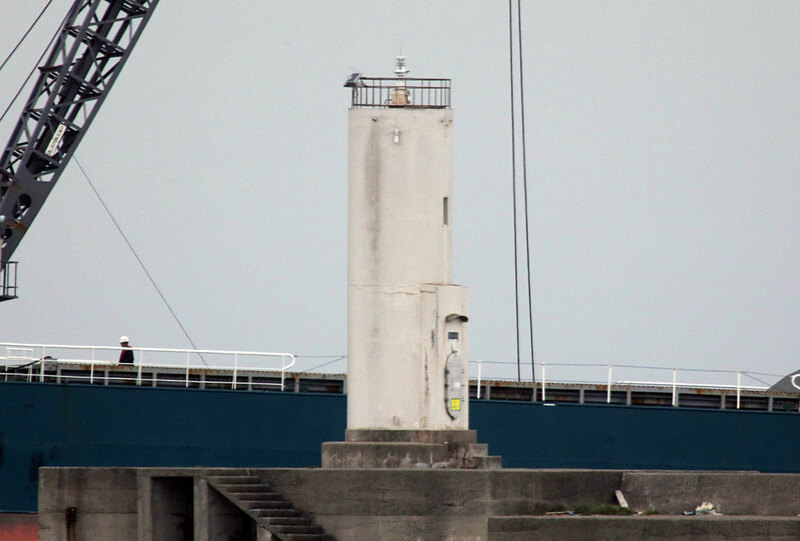 Located on a short breakwater on the north side of the entrance to Ōsaka's traditional harbor. Site and tower closed. JCG-3588; Admiralty M5915. Date unknown. Active; focal plane 52 m (171 ft); white flash every 5 s. 50 m (164 ft) round cylindrical concrete tower with a round skeletal tower and two galleries supporting various equipment at the top. The equipment presumably includes harbor control radar. 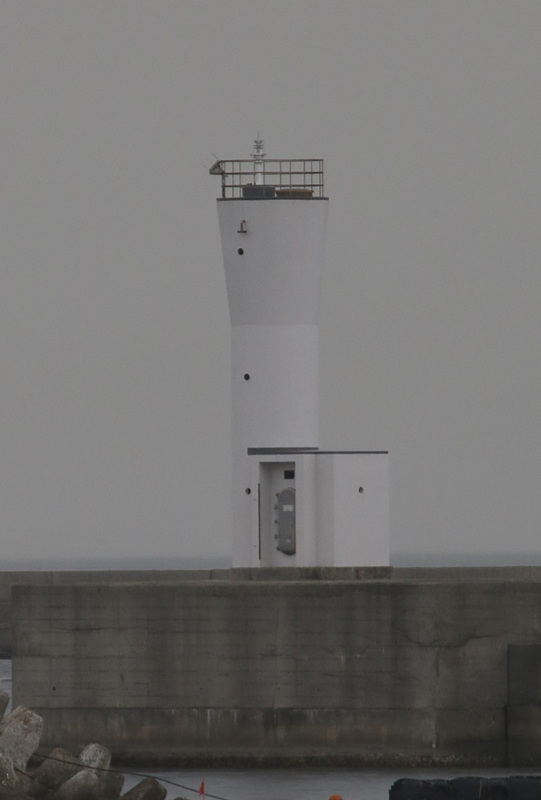 Entire lighthouse is unpainted gray concrete. The Coast Guard has a photo, Trabas has a photo of the lighthouse in action, Kiso has a good photo, a distant view is available, and Google has an excellent satellite view. This tower probably replaced a historic lighthouse located on the original shoreline of the area. Located at the southeast corner of a large artificial island being created between the north and south harbors of Ōsaka. Site and tower closed. ARLHS JPN-814; JCG-3602; Admiralty M5932; NGA 7348. Date unknown. Active; focal plane 13 m (33 ft); green light, 3 s on, 3 s off. 9 m (29 ft) concrete post centered on a round 1-story concrete equipment shelter, mounted on a square concrete pier. Entire lighthouse is white. The Coast Guard has a photo, Trabas has a photo, and Google has a satellite view. Located at a channel junction within the North Harbor. Accessible only by boat. Site status unknown. ARLHS JPN-1917; JCG-3600; Admiralty M5920; NGA 7344. Ōsaka Breakwater (1911-?). 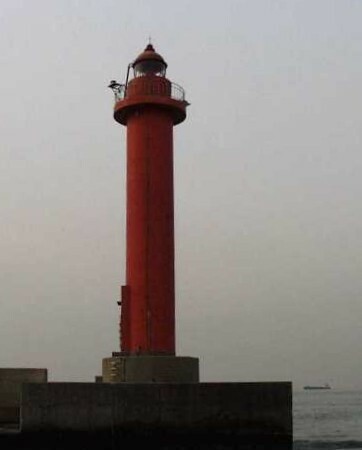 There were two of these lighthouses; they disappeared when the harbor was expanded. Posted December 22, 2006. Checked and revised May 9, 2018. Lighthouses: 29. Site copyright 2018 Russ Rowlett and the University of North Carolina at Chapel Hill.